" Thank you so much for the wonderful Kiddush... The food was delicious, beautiful and defintely plentiful! Everyone loved it! " " Your attention to detail, "sage" advice and ability to get things done translated into an absolutely fantastic party that our guests are still talking about. The food was not typical "picnic" food - the menu choices were unique and varied and yummy!!! The room decor with the balloons and decorative table clothes really helped create a party atmosphere. " "...Pattie is a genuinely nice, warm person and that extends throughout the whole process... Having Pattie coordinate things was one of the keys to the success of our affair... I wouldn't hesitate in the least to use All Occasions Catering again. Pattie's a good person, she's excellent at running things and her husband, David, is a hell of a good cook! " 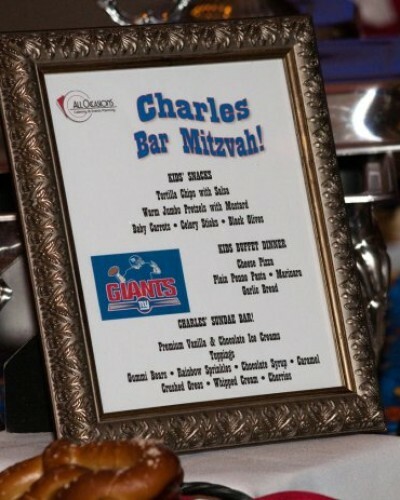 " Thank you, Pattie, for a beautiful and memorable Bar Mitzvah. It was perfect, thanks to you. And you were superb to work with, from start to finish. Your approach to problem solving was to find a way to make anything do-able. " Jocelyn G.
" My son, Harris, and I recently "celebrated" the one year anniversary of his bar mitzvah and people are still raving about it! Our family and friends from downstate and D.C., who are all very used to a certain "style," still remark about the class, the presentation, the decor, the fantastic appetizers, the wonderful desserts, the stylishly delicious yet simple entrees, and even the amazing vegetables that changed veggie haters into eager eaters! " JoAnne and Harris W.